This entry was posted in Home, Recipe Index, Salads and tagged Apple, CHICKEN, Potato, Salad, Smokey by Ginger Smoothy and Otto Pilot. Bookmark the permalink. OK, who is Ruth? Nice recipe and and the photo is great. I like the ingredients, especially the chipotle en adobo. I have a couple of questions/thoughts. 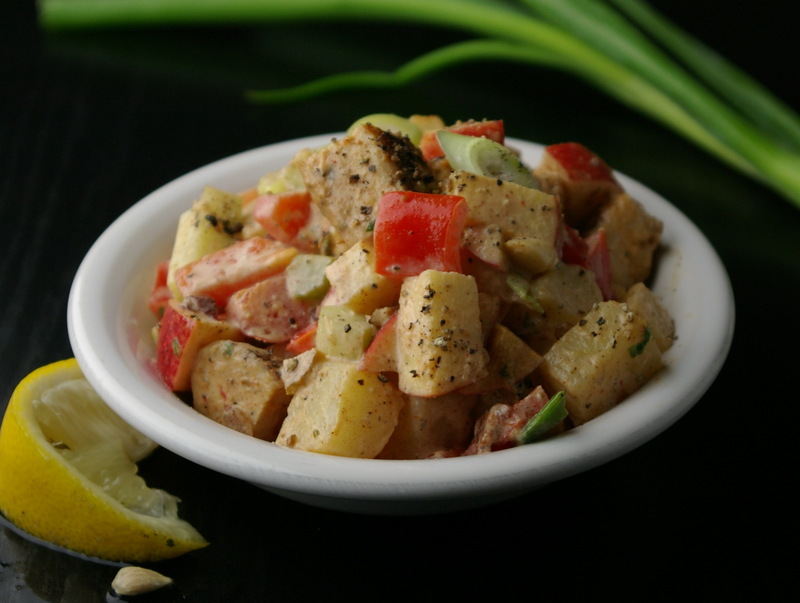 First, have you ever tried potato salad with roasted potatoes instead of boiled? I find with boiling the potatoes you pick up extra water which doesn’t happen with roasted potatoes. But with roasted potatoes you have the skin. Sometimes I like the skin in my potato salad, other times not. The next thing is I make a pickled chipotle (Chipotle en Escabeche – http://remcooks.com/2012/01/23/pickled-chipotle-chiles/) that is sweet and tangy and am curious how it would go with this recipe. You would lose some of the cleanness of the tang from the lime or lemon but it delivers great smokey flavor. I may have to play with this and let you know the results. You are absolutely right about the roasted potatoes, I usually don’t skin the potatoes, but thought that I should try and make things look as neat as possible while I’m still in the learning stages for my pictures. Do you use certain types of potatoes? You are so lucky to live where you do and have the availability of all of my favorite ingrendients. I think a red potato with the skin on it would be good . I can only find the peppers in small cans across the boarder in Mi., and I cannot find just the adobo sauce anywhere. I did however find some dried ones in Toronto. I think I may have to start ordering things online and having them shipped to me. I just looked at your recipe for the pickled chipotle, and it looks awsome. I really want to make some and jar it up. I think they would be perfect with this sort of recipe , now you have me thinking of more variations. My head is spinning with ideas now. Thanks.